As I mentioned in yesterday’s post, I’ve been placing a high emphasis on adding more classic pieces to my closet. And there is nothing more timeless than a tailored shirt dress (see the proof here & here). So when I came across this one in store on major clearance, I didn’t think twice. I was going for a relaxed feel, but if you wanted to create more of a shape, you could add a leather belt to cinch in your waist. This type of dress works well on its own with the sleeves rolled up & paired with flat sandals + fedora…or you could easily dress it up with simple pumps & a bright lip – the possibilities are endless! LOVE love LOVE that dress! And your arm stack is gorgeous! Love this look! Just got a pair of the Ray Ban Wayfarers and I'm in love! Love, love, love your dress! And great idea to pair it with the vest. Great inspiration! 🙂 Thanks for the alternative dress finds, too! 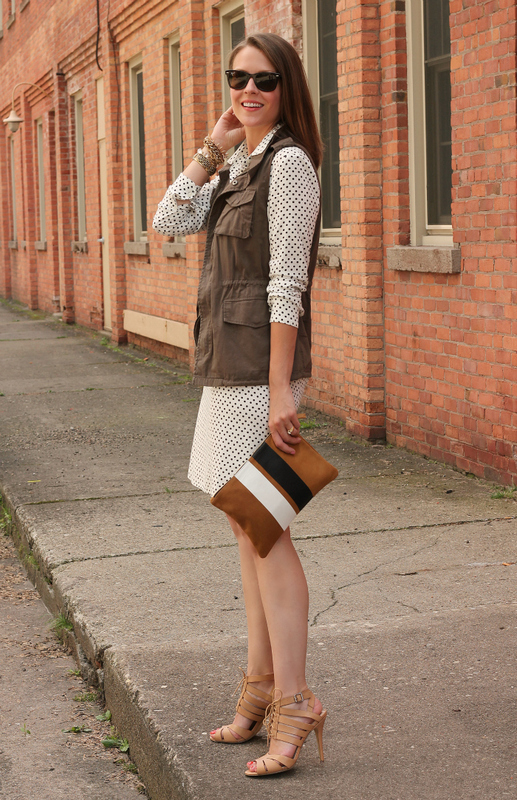 Great vest and shoes! I like this outfit! i like the vest a lot! Love your dress. What a great deal. Gorgeous dress and amazing find! 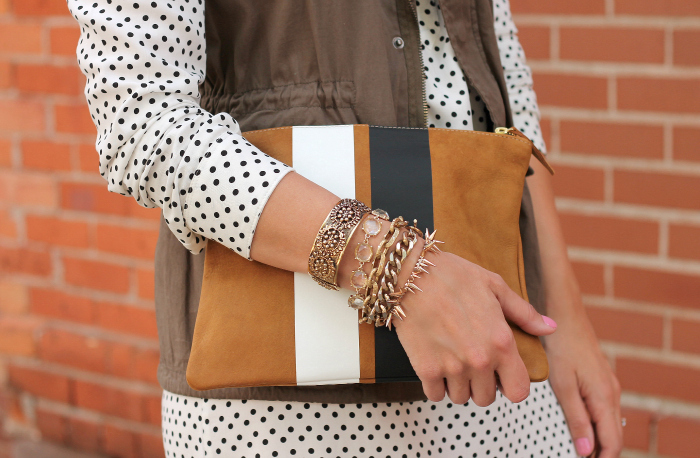 I love that you paired polka dots with stripes… my favorite combination. I've been in love with that Clare Vivier bag, FOREVER! It's such a perfect wear-with-all staple. 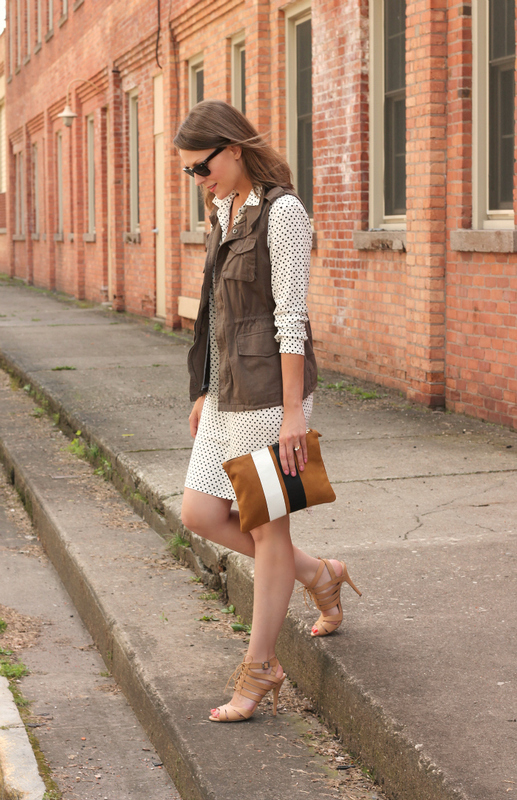 The neutrals go with everything! I am obsessed with that Gap dress! 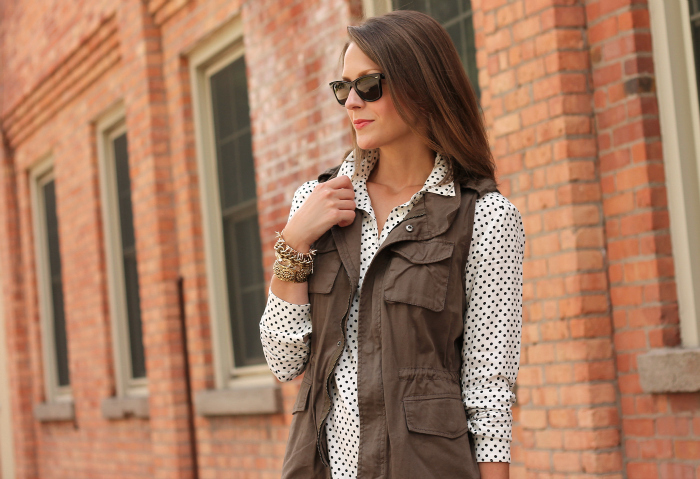 Love how you did it with the vest! What a great dress!! I wonder if they still have it in my store. This would be a good transition dress for me right now. I might have to copy this because the vest would hide my tummy. Love this, girl!! What a great dress! Love it. 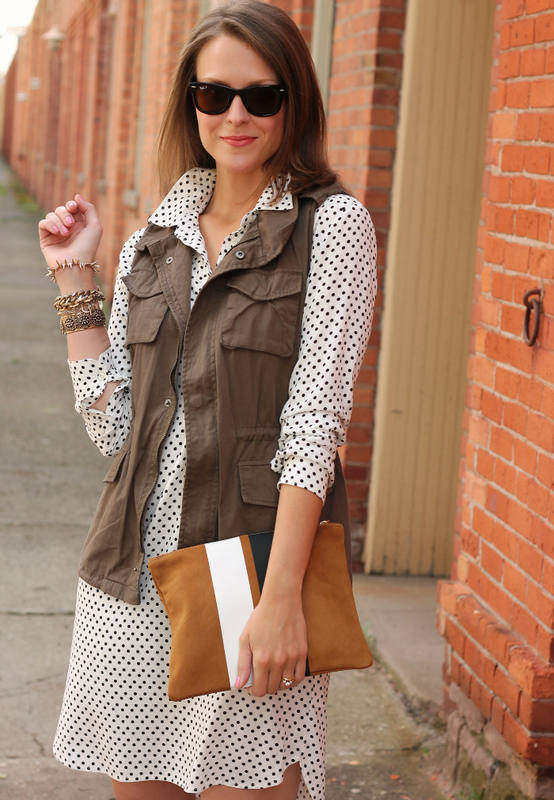 I would have never thought to pair this polka dot dress with a cargo jacket, but it looks great together! This dress is adorable, love the little dots! You are really making me want a utility vest! I already got a utility jacket in the spring and I love it, so I guess this is the next step 🙂 Great dress too! That dress is super cute, looks so cool contrasted with the edgy vest! what a cute dress on you! This dress is super adorable on you! I actually tried it on recently but it looked weirdly like a nightgown on me, maybe I should have added a cute vest. I LOVE THAT DRESS! Oh my gosh! 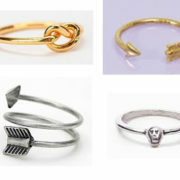 Need need need! So perfect <3 What a great post. I would love that dress for work! I love your style! BTW I went to Khols and bought me this jacket! Such a cute dress! And I love how you've styled it. 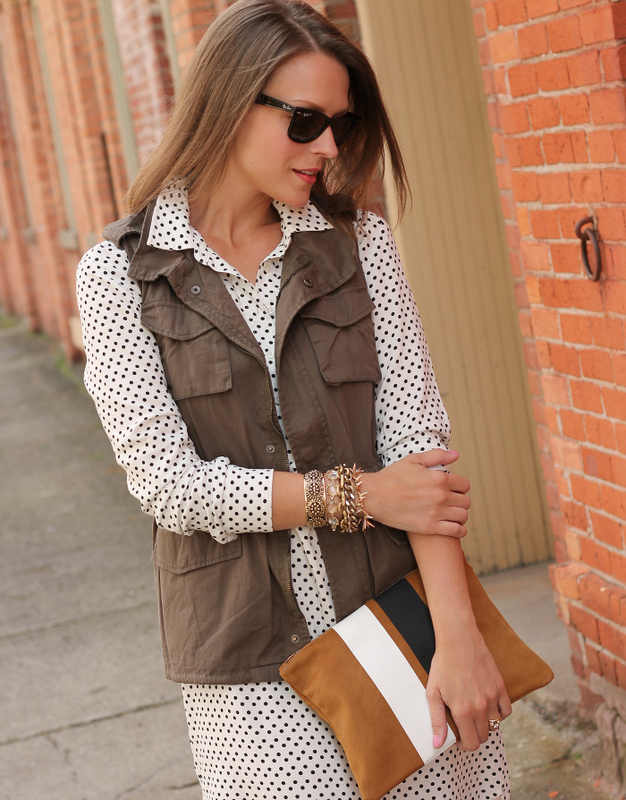 Love the dress paired with the vest! Obsessed with this look! I own that dress and wouldn't have thought to try it with a vest. The clutch is amazing too- love! A good shirt dress is something everyone should have in their closet. Love this polka dot one!